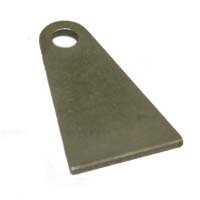 This tab is used on the f/c chute lever mount bracket m-115. The levers bolt to this tab. The base width of this tab is 5/8" and the thickness is 0.090". The hole size is 3/16" and the height of the center line is 0.656".